Click here to send a general enquiry to Powderhounds.com. If you are enquiring about a particular destination, please state this in the contact form. 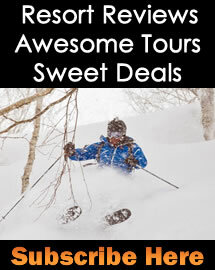 If you are wanting a quote for a ski resort package, you'll find package options and prices for many resorts on the website. Of if you're looking for accommodation-only, you'll find rates and availability for each resort on the website. Please note that if you are wanting to book a bus in Hokkaido for less than 9 days away, we are unable to assist with this. Click here if you would like to enquire about advertising or partnering with Powderhounds.com. There are no jobs available at Powderhounds.com, either now or anytime in the near future. We've got the best jobs in the world, and there's no way we're giving them up anytime soon! We are unable to assist with queries in relation to the job market at ski resorts or with tour operators, because we have no expertise in this area.